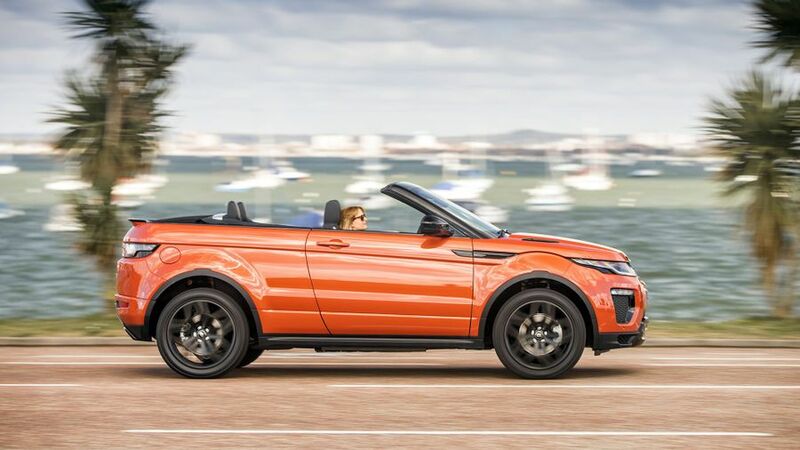 The Evoque Convertible is an open-top version of Range Rover’s stunning SUV, and on that score it competes with – well – pretty much nothing else. However, potential buyers will probably also consider the Audi A5 Cabriolet and the Mercedes C- and E-Class Cabriolets. It’s hard to compare the Range Rover Evoque Convertible to direct competitors, because it doesn’t really have any. Take the 4x4 aspect out of it, however, and compare it to other prestige four-seat convertibles, and it trails the likes of the Audi A5 Cabriolet and Mercedes E-Class Cabriolet in most areas, most notably comfort, quality and affordability. 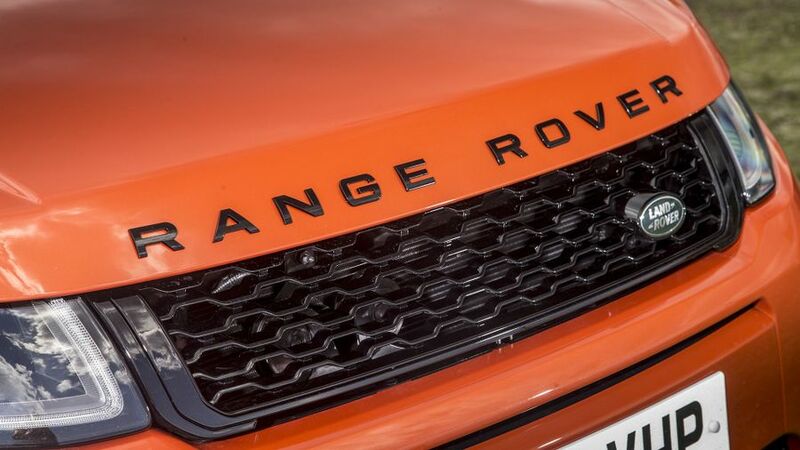 If you’re a fan of the Evoque’s looks, though, you probably won’t care a jot. 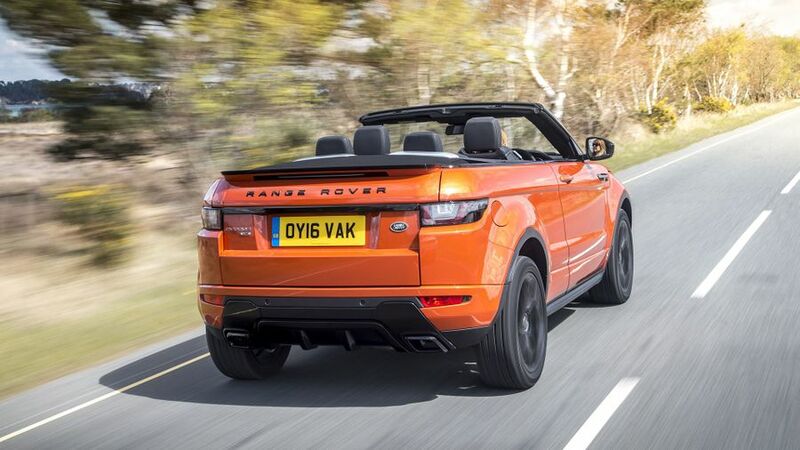 It’s fair to say that there’s nothing else quite like the Range Rover Evoque Convertible. 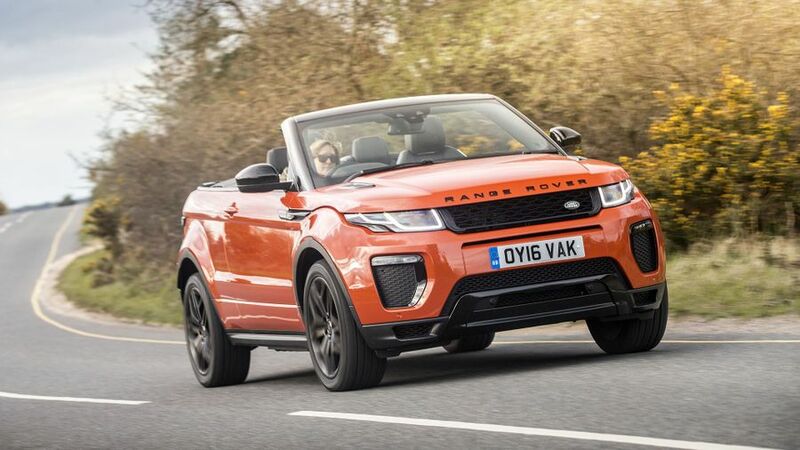 In hard-topped SUV form, the Evoque is already widely regarded as a visually stunning car, and transforming it into a drop-top certainly hikes up the visual drama even further. It’s also fair to say, however, that such an unconventional, brash, in-your face design will inevitably divide opinion. For more extroverted buyers, the looks of the car on their own will be enough to persuade them to part with their hard-earned cash. However, there’ll be just as many folk – maybe even more – for whom the strange mix of genres will not sit right at all, and who wouldn’t be seen dead in one. One thing is beyond doubt, and that’s that the car gets plenty of attention, even if some is of the green-with-envy variety and the rest is of the pointing-and-laughing variety. All versions come on massive 20-inch alloy wheels and have bits of gloss-black exterior trim, while front foglights and sparkly xenon headlamps with LED accents are also standard. 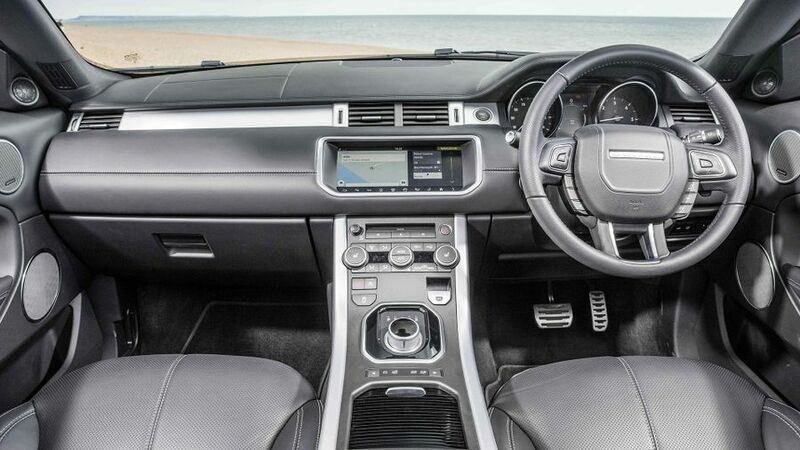 The Evoque has a cabin that befits a car wearing a Range Rover badge, with mostly high-quality materials giving the car much of the look and feel of its larger (and more expensive) siblings. There are one or two places – like on the indicator/wiper stalks and window switches – where the plastics look and feel a rather less lustrous, but the overall impression is still one of sophistication. The high-set driving position gives a good view of the road ahead, but your rearward visibility with the roof up isn’t nearly as clear due to a tiny back window flanked by large expanses of canvas. 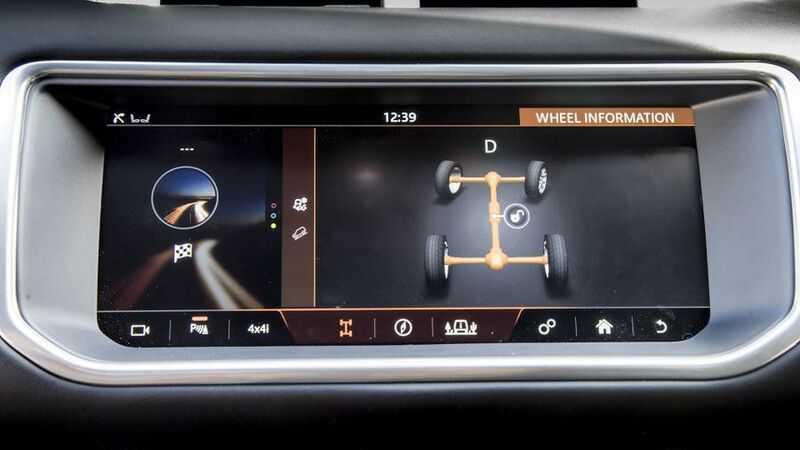 The dashboard has a reasonably uncluttered design thanks to most functions being taken care of through the touch-screen infotainment system, but while the sharp graphics mean it looks good, the slow responses and confusing menus mean it’s not all that simple to operate. Practicality is usually an afterthought where convertibles are concerned, but even so, the Evoque doesn’t do as great a job as you might expect. There’s plenty of space for those up front, but the two rear seats are rather short on both knee- and foot space, and anyone who’s six-foot or above will find their heads brushing against fabric when the roof is up. Getting in in the first place takes some proper effort, too, because the space between the front seat and the bodywork that you have to climb through to get in is rather narrow. 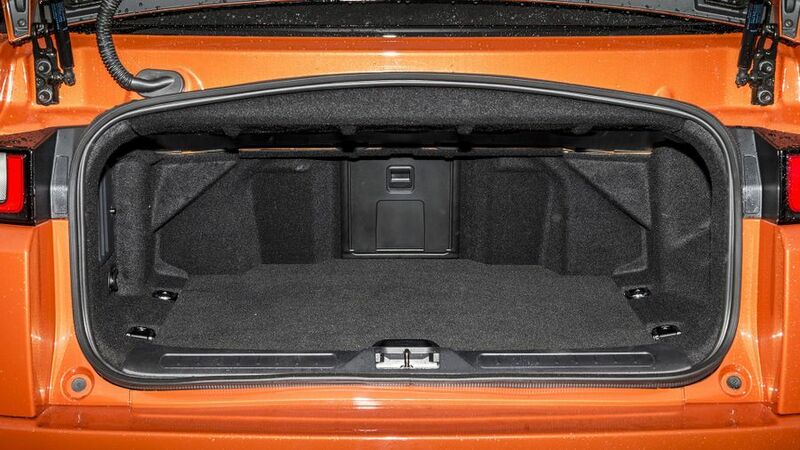 The boot is also pretty tiny at 251 litres, while the space is also rather shallow and the opening is awkwardly low-set, meaning you’ll be almost crouching as you load anything heavy. What’s more, the rear seats don’t fold or tumble in any way, so there’s no way of boosting capacity for particularly big loads. When a car loses its solid roof, it inevitably becomes a lot less rigid, and that means the body is far more prone to shakes, wobbles and flexing. Extra bracing is often needed to help counteract this, and that usually means convertibles weigh a lot more than their solid-topped counterparts. 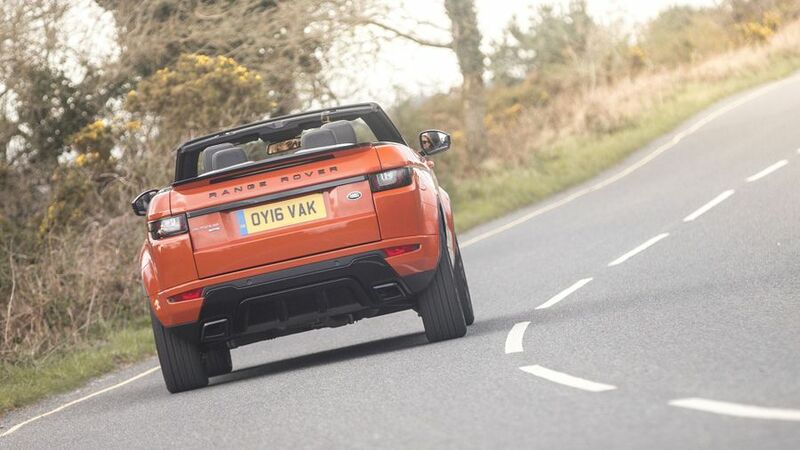 In the case of the Evoque, the weight difference is truly colossal, and because of the car’s jacked-up stance, the weight is also positioned that much higher up, meaning the car has a higher centre of gravity. All that being considered, it’s a little surprising that the Evoque Convertible doesn’t feel more top-heavy than it does. Yes, you can feel plenty of body lean in corners, but it’s not as severe as you might justifiably expect. The steering is pretty quick and responsive, too. Don’t go thinking that this is in any way a sharp car to drive, however. The laws of physics mean that corners inevitably make all that weight want to shift sideways, and you’ll hear your tyres squealing – even at moderate speeds – as they attempt to maintain their grip on the road. Handling isn’t this car’s weak spot, though; ride comfort is. In order to prevent the car’s body lolloping around in the bends, Land Rover’s engineers have made the suspension rock-hard, and that means it jitters, wallops and thuds along uncomfortably on most surfaces, especially at low speeds. Things get a little better as you get up to motorway pace, but there are countless prestige convertibles that give you a much plusher ride. Both engines offered in the Evoque Convertible are turbocharged four-cylinder units, one petrol with 240PS and one diesel with 180PS. Both of them come fitted with a nine-speed automatic gearbox as standard. So far, we’ve only tried the diesel and, to be honest, it struggles to cope with the car’s colossal weight. Compared with solid-roofed Evoques, the Convertible is a lot slower, both away from the mark and when picking up speed on the move. That’s not too much of a problem in itself – after all, a car like this doesn’t need to be fast – but the car’s sluggish responses can cause you issues. When you hit the accelerator pedal, the gearbox can take its time about engaging a gear and getting you rolling, and that really exacerbates the car’s inherent shortage of get-up-and-go. Try and exploit and gap in traffic, and it’ll often be long gone before the car wakes up and does what you tell it. The responses don’t get much sharper if you flick the gear selector round to the Sport setting, either. The fact that the engine needs to worked hard to maintain your pace means that it isn’t as quiet as it would otherwise be, but the noise still isn’t intrusive. Travel at any sort of pace with the roof down, though, and you do feel a little over-exposed to the elements with a fair amount of buffeting to be felt. The car’s weight can also be felt when you’re getting the car to slow down or stop, too, because it takes a real shove of the brake pedal to generate enough stopping power, often more than you give it initially, meaning a secondary shove is often needed. 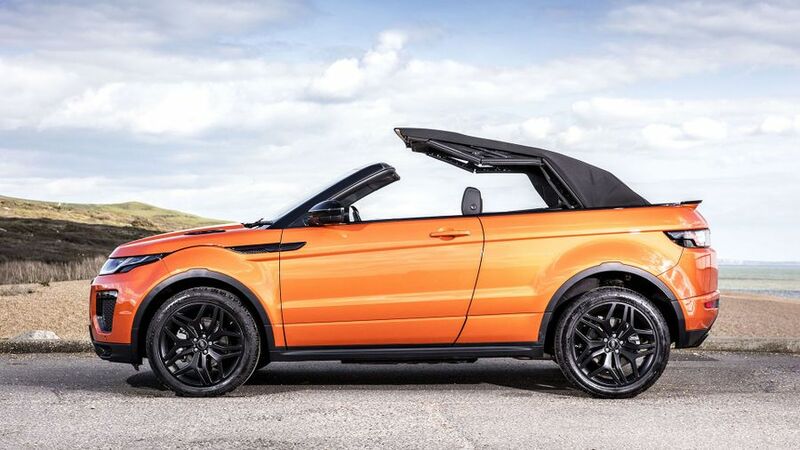 Although the Evoque Convertible is rather short on directly comparable rivals, it’s not a cheap car to buy by the standards of other prestige convertibles. It’s a bit more expensive than the equivalent Mercedes E-Class Cabriolet, and a lot more expensive than the equivalent Audi A5 Cabriolet. What’s more, its resale values aren’t as strong as those of its German rivals, meaning the Rangie’s whole-life costs will be even higher. Inferior fuel economy and CO2 emissions don’t do the Evoque many favours, either, another consequence of all that extra weight that the car is carrying. Even the diesel can’t crack the 50mpg mark according to official figures, while the petrol won’t even do any better 35mpg. Land Rover’s reputation in this area is far from sparkling, and one look at the Warranty Direct Reliability Index might explain why. The company sits perilously near the bottom of the manufacturer rankings, although in fairness, the Evoque itself doesn’t feature in the study as an individual model. What’s more, Evoque owners who have posted reviews on our website have been uniformly positive about the reliability of their cars, and that should provide encouragement to any potential buyers. Like any new car these days, the Evoque Convertible comes with a variety of electronic driver aids to keep you shiny-side-up, and the fact it comes with permanent four-wheel drive as standard will help you maintain grip and traction in slippery conditions. All versions also come with all the airbags you could reasonably expect, along with systems that’ll warn you if you’re wandering out of your lane or approaching an obstacle in the road too quickly. The latter will also slam the brakes on automatically if you fail to react. On top of this, the Lux version has systems that’ll automatically steer you back into your lane and warn you if there’s a car sitting in your blind spot. The Convertible hasn’t been crash-tested by Euro NCAP, and it’ll be such a low-volume seller that it probably never will be. 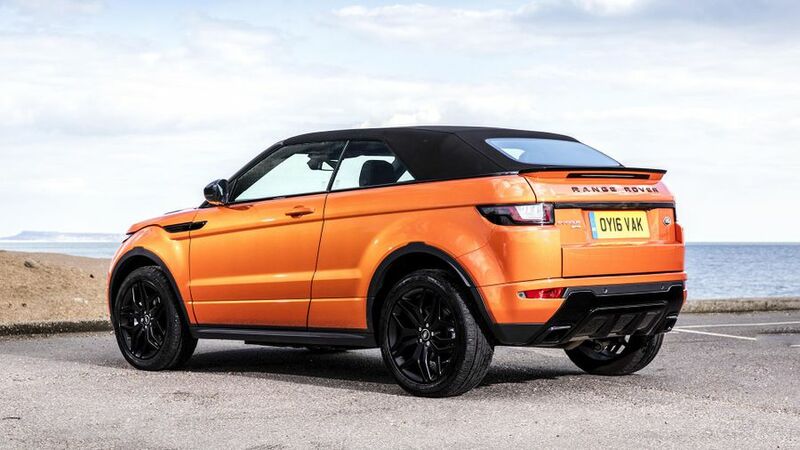 The regular Evoque has scored the full five stars, but that was back in 2011 when the tests were less stringent, and the structural differences between it and the hard-top car are such that we can’t be sure the Convertible would match that performance. The Evoque Convertible comes in two flavours known as HSE Dynamic and HSE Dynamic Lux. In fairness, the lower-end car is still pretty high-end for luxury kit, and the standard list includes a heated windscreen, climate control, leather upholstery, powered and heated front seats, power-folding mirrors and an infotainment system that brings together sat-nav, a rear-view camera, DAB, Bluetooth and a powerful speaker system. The Lux not only adds three letters to the name, it also adds a wind-deflector, a surround-view camera, high-beam assist (which flicks your headlights between high- and dipped beams automatically), keyless entry, an even more powerful stereo and a system that’ll park the car for you. 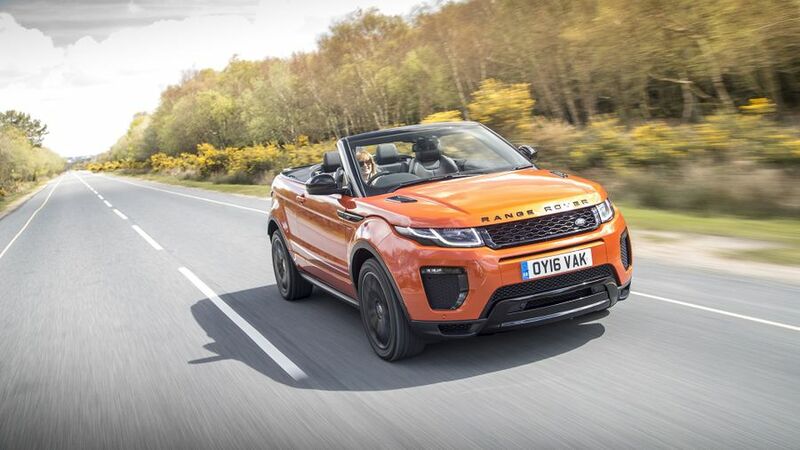 Because you want to stand out from the crowd in a way that you’ll only ever get with a car that’s as unconventional and as unique as the Evoque Convertible. It’s unquestionably a love-it-or-hate-it car, and for those who sit in the former camp, it might just be perfect. You probably won’t care a jot that it’s expensive to buy and run or poor to drive, or that a Mercedes E-Class Cabriolet will beat it in pretty much every measurable area.